Raven Studios has been dedicated to designing and producing high quality martial arts training swords, weaponry, and wooden dummies since 1998. Owner and artist of Raven Studios. Raven Studios training weapons can be seen in the hands of martial artists, not only in every state in the USA, but also in many countries all across the Globe! Raven Studios is located in Oracle Arizona USA, and every product is professionally hand crafted with materials that are carefully selected for maximum durability and pleasing aesthetics. Everything on this website is made individually, one at a time, by me personally. The items are not mass produced and there is no inventory of pre-made products. I make everything as the orders are placed and I take the time required to make the highest quality training weapons and wooden dummies. Depending on how many items have been ordered and are in queue, the estimated time of completion for one item ordered is typically about 12 weeks. Large orders may take a bit longer. If you need to know the turnaround time before your order is placed, just contact me by email or phone, and I will be glad to let you know the current schedule. The turnaround time is subject to change depending on the current volume of orders. When I receive your order I will send you a confirmation email, normally within 24 hours, and give you an estimated completion date. 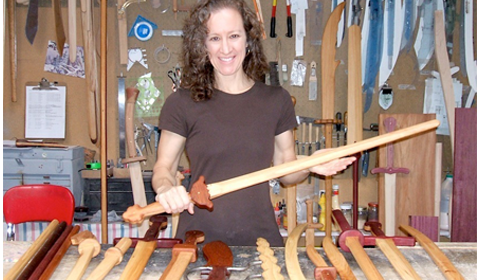 - Swords and Training Weaponry - Raven Studios hardwood training swords (wasters, bokken) and other weaponry are designed to combine maximum durability and proper balance for years of rigorous training. Suitable for sparring as well as for forms, solo technique practice, and controlled pell (dummy) practice. - Custom Work - Raven Studios gives you the freedom to design your own training weapon, or you can modify one of our products to fit your needs. If you have a special sword or practice weapon that you would like replicated, send me the design specifications (a photo and/or drawing is suggested) and I'll let you know if it's something I can do for you. Contact carinac@little-raven.com for a quote. - Wooden Dummies - Raven Studios Mok Yan Jong are engineered to last. Each jong is individually fashioned from carefully selected hard maple lumber. Hard maple is an extremely durable wood with very tight grain structure. Fabricating the dummies with laminate construction techniques results in maximum durability, reducing the risk of cracking or splitting, for a jong that is solid, rugged, and could be proudly passed down from generation to generation. Thanks to the ongoing feedback from many knowledgeable martial artists, Raven Studios will continue to refine and improve and serve the worlds martial arts community. - Hickory (From North America) - Light cream to tan color with brown streaks. Extremely tough and resilient with outstanding impact strength. Typically used for various sports equipment and tool handles. - Jatoba (From Central and tropical South America) - Also called Brazilian cherry. Russet to reddish brown with an interlocking straight grain. Very hard, heavy, and tough. Very similar in structure to Purple Heart. Typically used for flooring, railroad cross ties, gear cogs, and other specialty items. - Purple Heart - (From Mexico to tropical South America) Dull gray brown when freshly cut but soon oxidizing to a violet purple, darkening over time. A very hard and heavy wood with straight grain. Typically used for industrial construction, ship building, and flooring. - Hard Maple - (From North America) Also called rock maple, sugar maple, or country maple. Light cream color with brown streaks. Known for it's durability and strength with tight grain structure and fine texture. Typically used for bowling pins, bowling allies & other flooring, cutting blocks, and baseball bats. - White Oak (Quarter-sawn) - (From North America) Beige to creamy tan, Very tough with good impact strength. Quarter-sawn lumber has very straight grain which results in more impact strength and less warping. Typically used for boat building, bridges, flooring, mining timbers, and furniture.